This article will aid users in completing an Outside Activities Report (OAR) in the Streamline (BPLogix/eWorkflow) application. Pursuant to UW System policies, all Faculty, Academic Staff, and Limited appointees with appointment of half-time or greater must report outside activities annually. 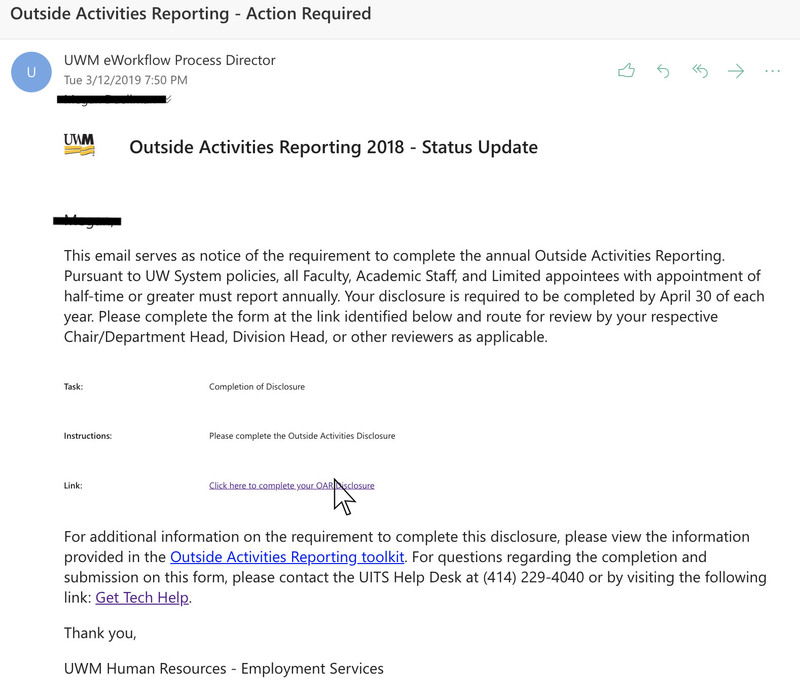 Each appointee will receive an email from UWM HR via the UWM Streamline application, also known as the eWorkflow Process Director. The Outside Activities Disclosure is due by April 30 each year. Any questions regarding this request should be directed to the UWM Help Desk. To complete the disclosure, begin by opening your campus email. 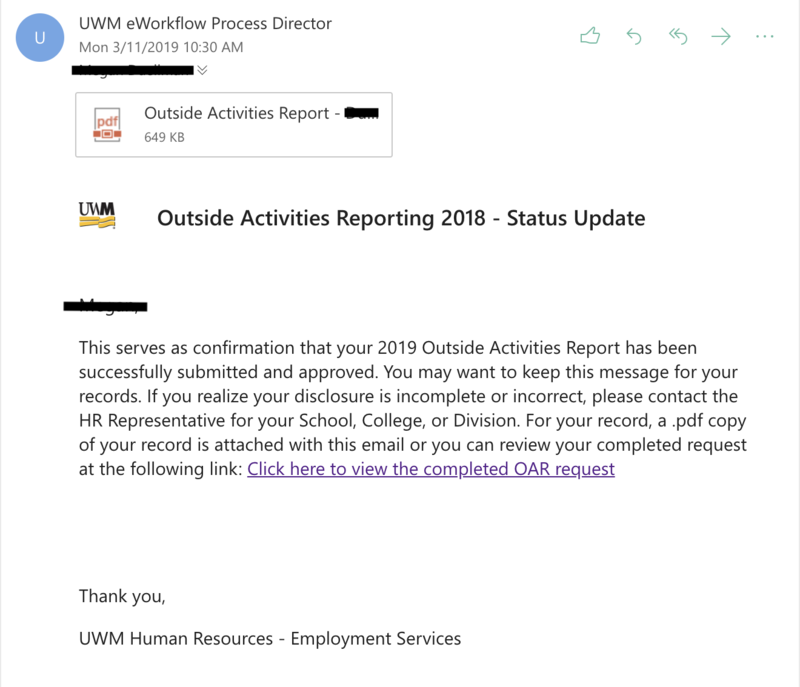 Click to open the email from UWM eWorkflow Process Director titled Outside Activities Reporting – Action Required. This will open a new tab with the Outside Activities Reporting (OAR) disclosure. Once you arrive at the Outside Activities Disclosure read the introduction at the top of the page. Click on the link to read the Guidelines for Reporting Outside Activities This will open the Outside Activities Reporting Toolkit in a new tab. Read through the information on this page, and return to the tab with the OAR Disclosure. After returning to the OAR Disclosure, review the section titled Submission Details and verify that your Employee ID number is correct. Note: If there are any corrections needed to the Reporter Identification Section please contact the UWM Help Desk. After reviewing the appointment details, check the box to Select to add Additional Appointments if you have a split appointment or additional appointment information to provide. Note: Only make this selection for appointments at UWM. If you do have additional appointments to add, select this box. This will populate an additional section to your disclosure to Add Additional Appointment Details. Click on the drop-down menu for Division. Select the division where your split or additional appointment is held. Select the department where your appointment is held. Select the type of employee which you are categorized as for this appointment. Repeat the previous steps until all additional appointments are added. To remove an additional appointment, click the X button under Remove Row. Once you have completed the Reporter Identification section, continue to the Activities Disclosure section. For the Activities Disclosure section, you will be required to read the Guidelines for Reporting Outside Activities, if you have not done so already. After reading the guidelines, determine if you have any outside activities or associations to report. If you do not have any to report, click Select, to Confirm that I have read the Guidelines and do not have any remunerative outside activities or associations with organizations in my field of interest to report. Check the respective box if you have received net remuneration for professional outside activities in your field of professional interest. If you have received compensation from a nongovernmental sponsor of university research, teaching, or training for which you were the principle investigator click the respective box at the bottom of the Remunerative Relationships box. Check the respective box to identify any business or other organization related to your field of academic interest or professional specialization for which you or your immediate family served as an officer, director, or trustee. Note: Type in or select State from the drop-down menu. Once you begin typing this will auto populate your state based on the first letters you type. Check the respective box if you have any business or other organization related to your field in which you or your immediate family individually, or in aggregate, owned or controlled at least 10% of the outstanding equity. The purpose of the Reviewer Assignment is to show you who will be reviewing your OAR Disclosure. First Review and Second Review are the order in which your disclosure will be assigned. Generally, your First Review will be your Director or Department Chair, and your Second Review will be your Dean or Division Head. Next complete the Additional Comments and Supporting Documentation section. Enter your cursor in the text box under Additional Comments to add comments to your disclosure. Note: It is recommended that you copy and paste comments from another source such as a word document, so you do not lose your work for any reason. Once you have finished entering additional comments and uploading supporting documentation review everything you have disclosed. Note: The purpose of the Routing Slip section at the bottom of the page is to show you and the reviewers the process history of your disclosure. You do not need to disclose anything in this section. After reviewing your Outside Activities Report, complete the Certification section of your disclosure. You cannot submit your disclosure until all errors are corrected. If you try to go back into the form after it has been submitted, you will be brought back to this confirmation page. Click this form to exit the disclosure. YOUR WORK WILL NOT BE SAVED! Once you submit your form it will be sent to your first reviewer. Upon first review completion, your form will be sent to your second reviewer. After your form has been reviewed and approved by both reviewers, you will receive email confirmation with your disclosure attached as a PDF document. You are encouraged to keep a copy for your records. Thank you for completing your OAR disclosure! If you have any questions visit our Streamline/BP Logix (FAQ) Outside Activities Reporting page.